I hesitated for some time whether to upload this recipe because quite frankly, its a bit of a faff. Now before you click that little cross at the top right hand corner of the screen, hang back a minute. The faff is merely the time it takes to make as opposed to its complexity. Now ill be upfront about it, this will take you approx 2 hours to make and it’s that which I assumed would put people off. Not to mention the fact you need to buy a pasta machine as well. So why bother? I’m not going to spend the remainder of this post trying to convert the nation into ditching the dried pasta & start making their own. Either you want to or you don’t. Either way, bear in mind this kind of cooking is not designed for a mid-week meal. It’s more like bread making. We can buy bread from the shops and most of us aren’t going to faff around with baking a fresh loaf every day, but we try it from time to time just to have a go. Ditto with pasta making. I’ve made ravioli without a pasta machine before, and it can be done, provided you have determination, strong arms & a heavy rolling pin. In the end I could never achieve the smoothness and thinness that a pasta machine brings. My pasta machine is from Lakeland and while I may not use it every week, I think it was a good investment. Its a reliable piece of kit which stands the test of time and I’m more tempted to make pasta more often, because I have the machine. This machine came with the attachment for spaghetti and tagliatelle and there’s a plethora of further attachments you can buy to advance your pasta making skills. However for lasagne sheets and ravioli you don’t actually need any attachments. This is useful to bear in mind if you’re buying your machine second hand and doesn’t have all of the attachments. I use The Chiappa Sisters recipe for pasta dough: 100g Flour + 1 Egg = 1 Person. While my recipe will serve 3 (because it uses 300g Flour + 3 Eggs) it can be reduced or increased depending on how many people you are serving. All you would need to do it adjust the filling accordingly. 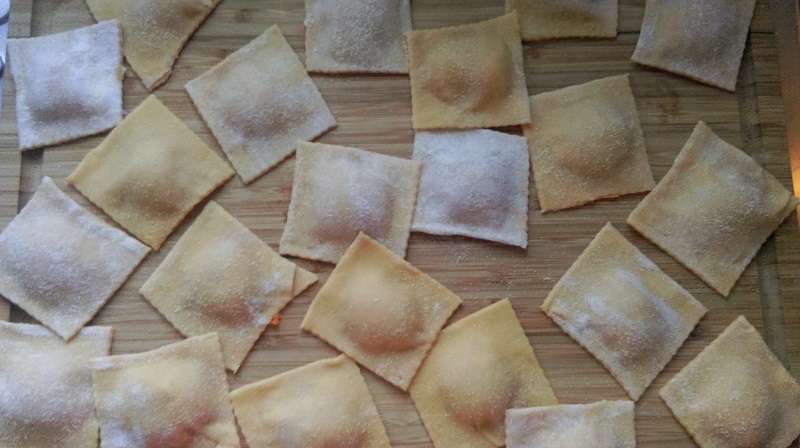 I typically serve 5-6 pieces of ravioli for dinner (its surprisingly filling) but 2-3 pieces per person would also work as a starter. Keep in mind that if you do make too much (a common occurrence in my kitchen), the ravioli will keep in the fridge for a couple days if you cover in cling film. Make it Gluten Free: Click here for The Chiappa Sisters recommendations on making Gluten Free Pasta. Heat the oven to 180C and make a start on the pasta. Pour the flour onto a large work surface. Make a well in the middle of the flour & crack the eggs on top. 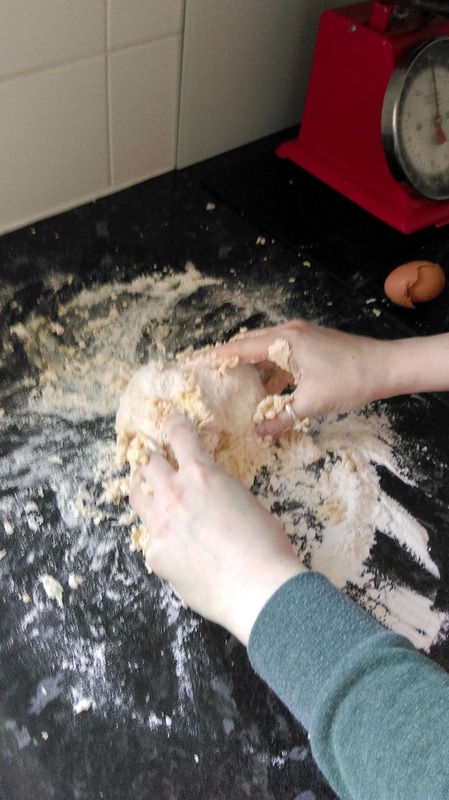 Using your fingers, start to mix the flour & egg together until it forms a lump. Now it will feel messy, gooey and like it’s just not coming together, but persevere and it will. If you are concerned the mixture is too dry add 1/2 tsp of cold water. If the mixture is too wet then add a little flour. Once the mixture has come together into a large ball you need to knead it for approximately 10 minutes. 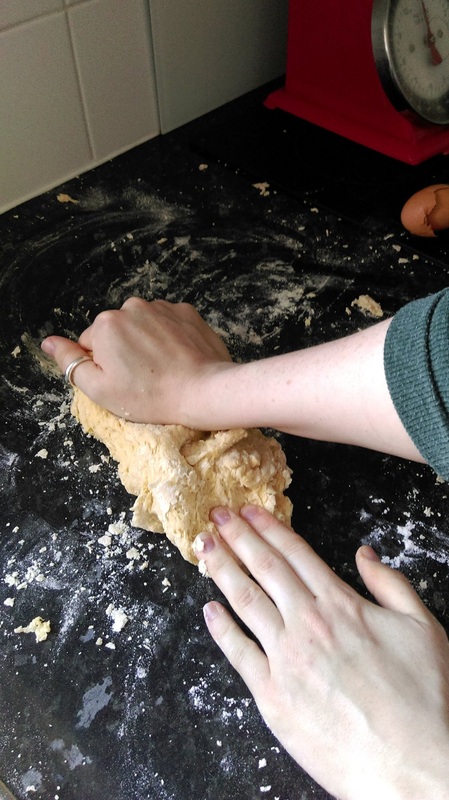 Knead the dough by pushing it away from you with your right hand (if you’re right handed) then pulling it back towards you. To be fair, it doesn’t really matter how you knead the dough so long as it’s manipulated in some form or another. The point is to activate the gluten in the flour to make a springy dough. You can use a machine, with the dough hooks, for kneading. I just prefer to do it by hand so I can feel when the dough is ready. Once you’ve kneaded the dough it should feel smooth and springy, kind of like play-dough. Wrap this in cling film & chill in the fridge for 1 hour. Stab the sweet potatoes with a fork several times, place in a roasting tin and drizzle with oil. Cook in the oven for 1 hour. 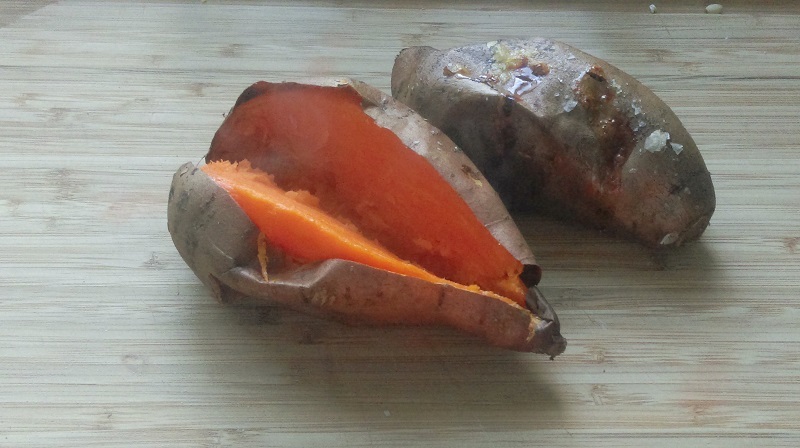 Once cooked, slice the sweet potatoes in half and scoop the flesh into a mixing bowl. Mash with the back of a spoon & leave to cool while you toast the pine nuts. Scatter the pine nuts into dry frying pan and cook over a low-medium heat until they turn a golden colour. Be sure to keep an eye on them because they can burn quickly. 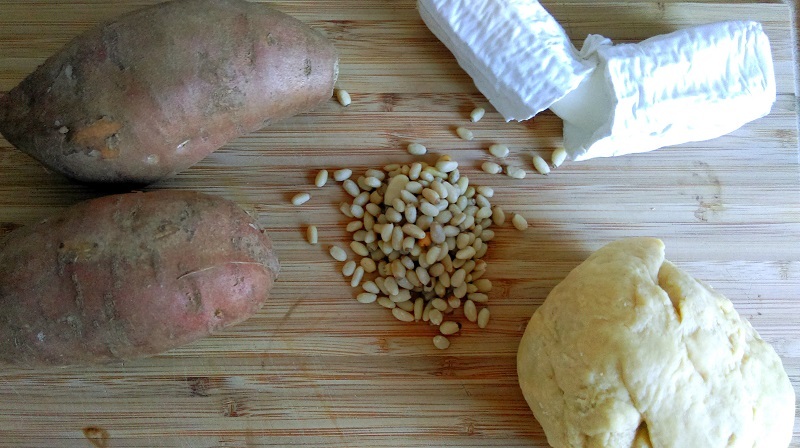 Add the toasted pine nuts to the sweet potato then crumble in the goats cheese and season with salt & pepper. Mix until combined and set aside until ready to use. FYI – without the salt & nuts, this would make excellent baby food! Set up the pasta machine at one end of a long kitchen counter (or table if you prefer). Flour the machine & counter liberally then sprinkle a little ground semolina & flour on another kitchen counter. This will be where you lay the long strips of pasta after rolling. Rolling it through the first few settings. 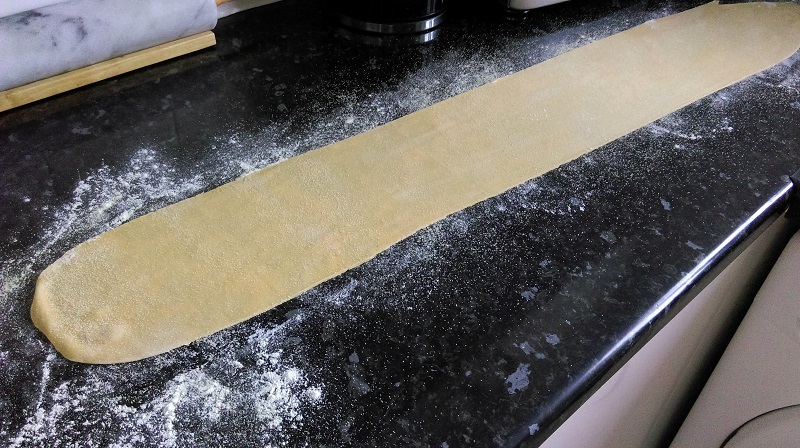 Just remember when you’re rolling the pasta, you need to flour the machine & the counter as you go to stop the pasta sticking. Cut the dough in half. Take 1 half and press with your hands to flatten it slightly. Set the machine to its widest setting (Setting 1) and roll 1 half of dough through the machine three times. 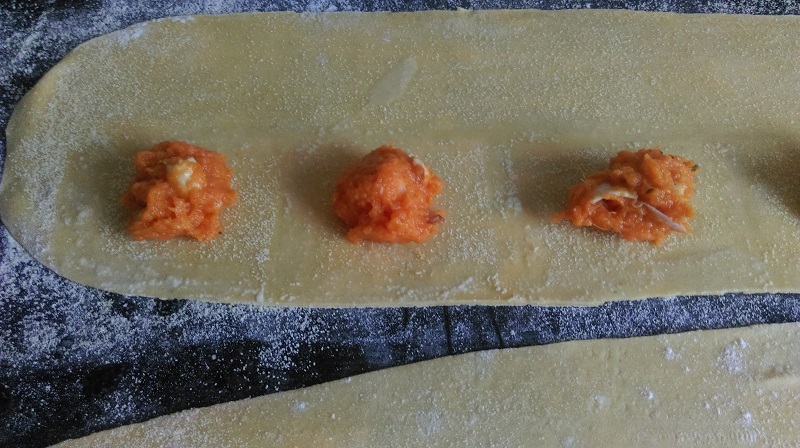 Fold the pasta into 1 third and run through Setting 1 twice. Turn the machine up to Setting 2 and run the pasta through twice. Continue this until you reach Setting 6 and run the pasta through twice. 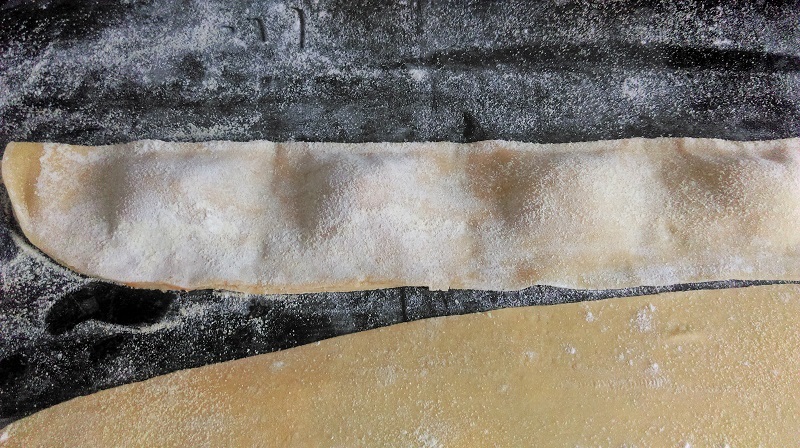 Lay the long strip of machine-rolled pasta onto the flour/semolina coated kitchen counter. Now repeat the process with the remaining dough. Start with 1 long strip of pasta. Fold it in half lengthwise and gently smooth to form a long crease. 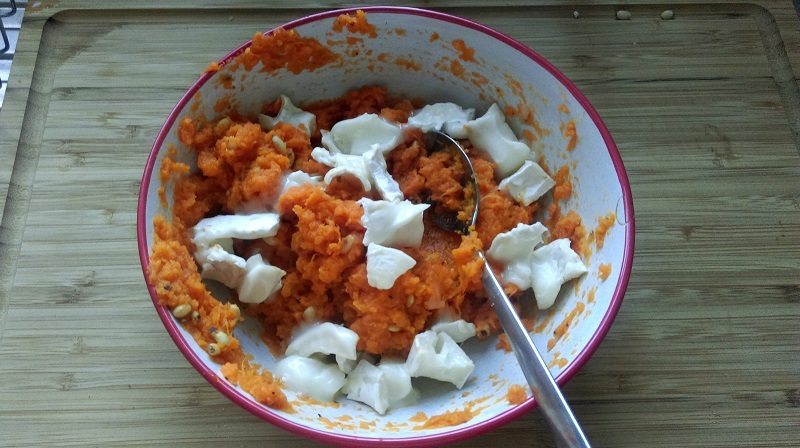 Dollop 1tsp of the sweet potato filling at intervals below the creased line. Fill a cup with tepid water from the tap. Dip your little finger into the water & lightly brush a square around each dollop of filling. Take care not to make the pasta too wet or it may stick to the counter. 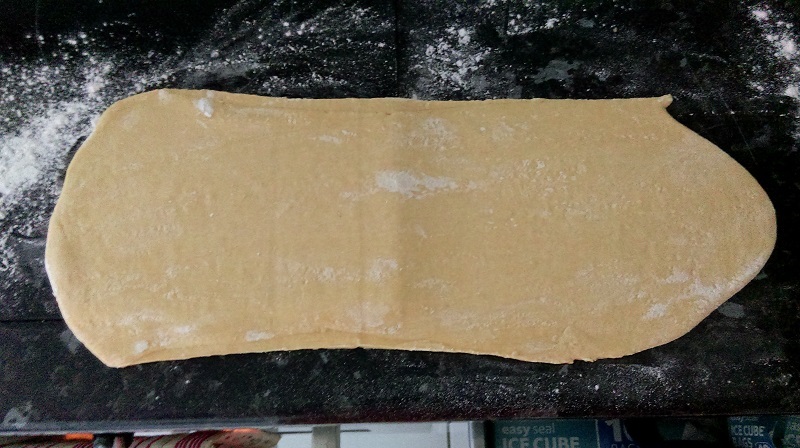 Fold the pasta sheet over to cover the dollops of filling. 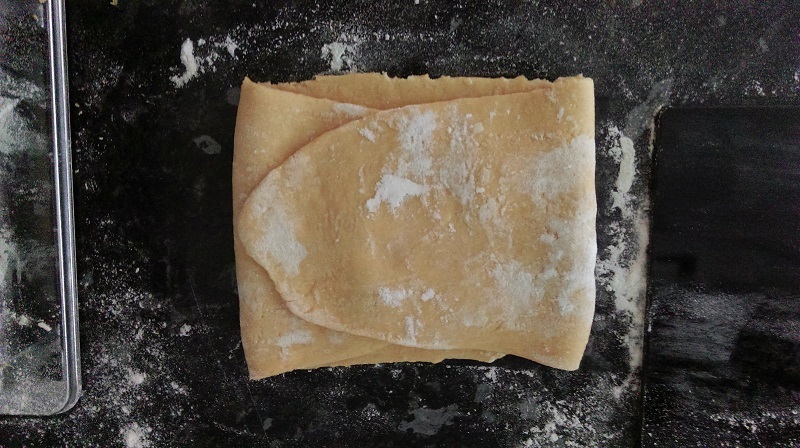 Using your fingers, firmly press down around each dollop of filling forming individual square ravioli. Do this for the length of the pasta sheet until you have a series of sealed mounds. Using a sharp knife or a pasta cutter, cut the sheet into squares. Press the edges of each piece with your fingers to ensure they’re sealed. 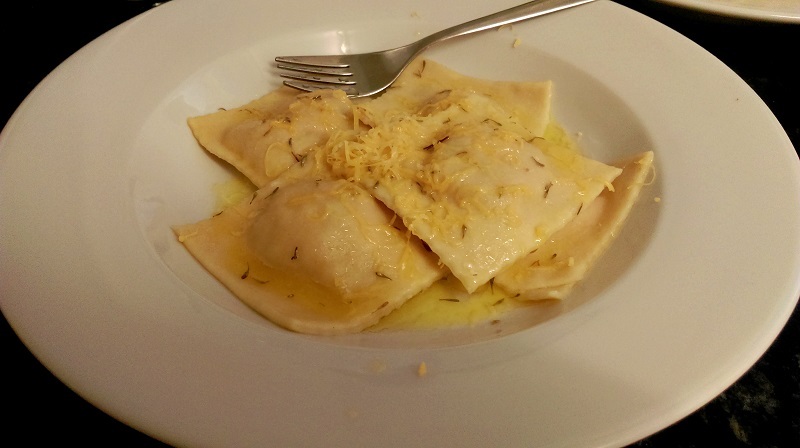 Sprinkle a chopping board or baking tray with flour & semolina and place the ravioli on this. Sprinkle more semolina on top. Set aside while you repeat the process with the 2nd strip of pasta. Bring a large pot of salted water to the boil. Meanwhile add the butter & herbs to a small saucepan and melt over a low heat. Cook the ravioli for 3mins. Once cooked, drain & carefully spoon onto plates. Drizzle the buttery sauce over the pasta & serve immediately. Some Parmesan & ground pepper on the table for people to help themselves to, wouldn’t be a bad idea either.